View More In Electric Griddles - Page 3. 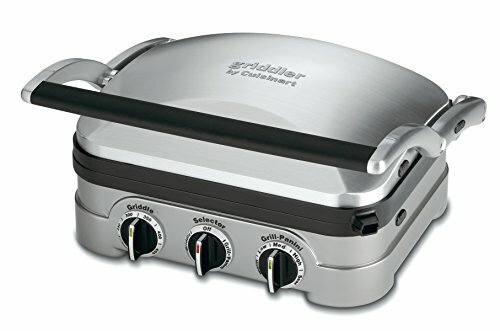 The Cuisinart Griddler makes "multifunctional" an understatement! with five separate cooking options, it can handle everything from pancakes to sausages to grilled cheese to steaks, hamburgers and Panini. A floating cover and one set of reversible plates that snap in and out turn the Griddler into a contact grill, a Panini press, a full grill, a full griddle, or half grill/half griddle. Dual temperature controls ensure everything is perfectly cooked!